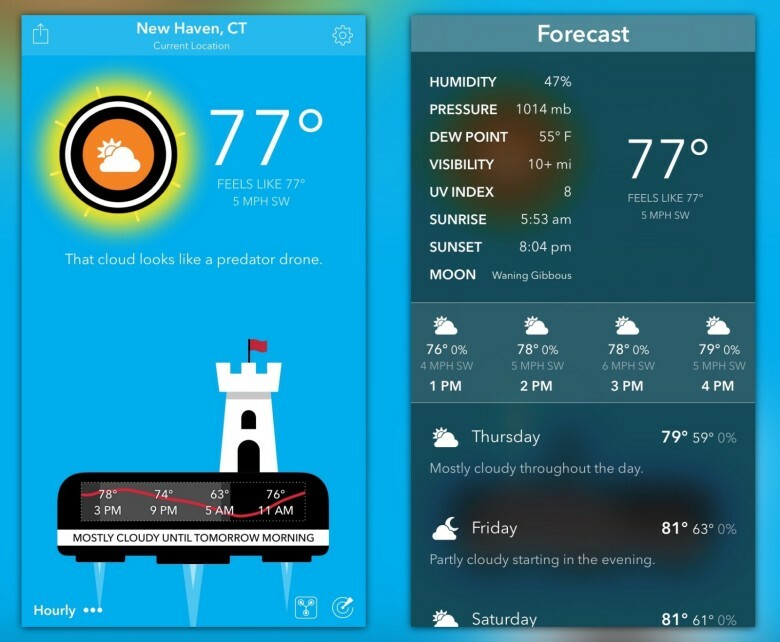 The Carrot Weather app for Mac is pretty similar to the iPhone and iPad apps, just a bit more cursor-friendly. The app displays current conditions with some more advanced tidbits like humidity and dew point, then has three separate views for short-term, hourly and a 10-day forecast. If you click a particular day, you get even more details and a brief description. That’s thanks to the highly accurate Forecast.io API from the same folks who created Dark Sky. Of course the star of the show is still Carrot, which provides a small dose of sass with every forecast. It’s 77 degrees and partly cloudy where I am and Carrot informed me “What a perfect day to rob a bank.” Every time I check the weather I never fail to chuckle at what Carrot has come up with this time. Sassy robots aside, my favorite feature is the mini-window that provides just enough weather information at a glance from the menu bar. It includes the current temperature and conditions as the icon – this is customizable in the Preferences – and drops down a condensed version of Carrot Weather when you click it. You can even toggle between locations from the mini-window. There’s plenty of other great features like time travel and notifications, too, so just do yourself a favor and go get it. The Carrot Weather Mac app is available for $9.99, which is 25 percent off for a limited time. On top of delivering a brand new Mac app, Carrot Weather for iOS also updated to version 2.0 which brought some yummy goodies along with it. To start, it works nicely with the new Mac app by offering notification forwarding. This means if Carrot on your Mac detects a severe weather alert, it can automatically forward a notification to your phone while you’re away. Other than that, the update brings a new time travel feature for seeing historic forecasts for a given day. Plus, you can now tap the icon on the bottom right to view an animated precipitation map. The app previously included a Today widget, but that’s been updated too with five possible designs that you can choose from in Carrot’s preferences. Carrot Weather for iPhone, iPad and Apple Watch is a universal app for $3.99. The iOS app became my favorite mobile weather app, so I don’t doubt the Mac version will quickly take the reigns on desktop.